White phosphorous smoke screens were fired by the U.S. Army in November 2004 on the outskirts of Fallujah, Iraq. In Iraq, the U.S.-led coalition has admitted — for the first time — to using white phosphorous during operations in the Iraqi city of Mosul. "We have utilized white phosphorous to screen areas within west Mosul to get civilians out safely," New Zealand Brig. Gen. Hugh McAslan tells NPR. He estimates that around 28,000 civilians have managed to make the dangerous crossing out of Islamic State territory in the past few days alone. Coalition spokesmen previously have confirmed the use of the incendiary substance in less-populated areas of northern Iraq in the fight against ISIS. But this is the first confirmation that white phosphorus has been used in Mosul. McAslan says Iraqi forces backed by the coalition have retaken almost 90 percent of western Mosul — the last holdout of the extremists in Iraq's second-largest city. But ISIS still controls a densely populated enclave, where the U.N. says tens of thousands of people remain and have been used as human shields. The U.N. Human Rights Council says it has received credible reports that ISIS increasingly is targeting civilians as they try to flee, leaving more than 230 dead in recent weeks. 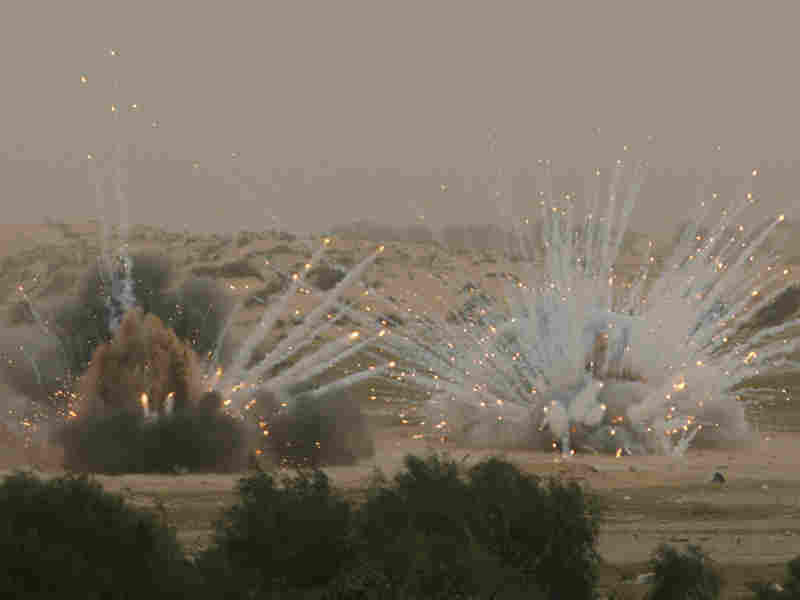 White phosphorous munitions are blown up by U.N. and Hamas sappers, not seen, in the Khan Younis refugee camp in the Gaza Strip in March 2010. The munitions remained unexploded since the Gaza war in 2008, when they were fired. Human rights organizations have warned that the use of white phosphorus to produce obfuscating smoke screens carries deadly risks in an urban setting. Amnesty International says the substance can cause "horrific injuries, burning deep into the muscle and bone." The incendiary substance can reignite weeks after being deployed, causing potential harm to those fleeing or returning. Amnesty made those warnings in a report documenting the use of white phosphorus east of Mosul in 2016. At the time, it said that the use of the substance in the vicinity of population centers "constitutes an indiscriminate attack and can be a war crime." 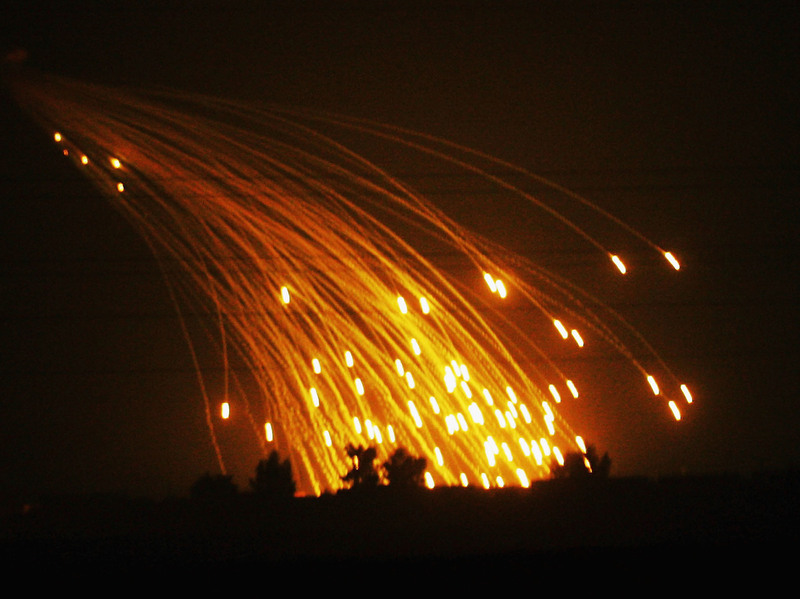 White phosphorus, which bursts into flame when it hits oxygen, is not banned under the Chemical Weapons Convention, but its legality is linked to its use. In 2005, the CWC spokesman Peter Kaiser told the BBC that white phosphorus is permitted in war if used to camouflage movement, but not if it is employed as a weapon. The U.S. military has admitted using white phosphorous in the 2004 battle for Fallujah in Iraq, and in Afghanistan in 2009. Israel used it in the 2008 Gaza war, but said in 2013 that it would stop. The coalition admission comes amid fresh allegations that white phosphorus also is being deployed in the fight for Raqqa, Syria. There, the U.S. is backing an alliance of Kurdish and Arab partner forces to seize that city from Islamic State control. Those forces have made gains in recent days, pushing into the city for the first time since the campaign began. In recent days, the ISIS-affiliated media outlet Amaq released a video purporting to show white phosphorous raining down on Raqqa by night. Amnesty International says it has not yet been able to verify the Amaq footage, but is urging U.S.-led forces to refrain from using white phosphorus in Raqqa and its surroundings, where civilians remain trapped. The rights group says the risk to civilians is "unacceptably" high, and could potentially count as a war crime. The Amaq video prompted rare unity in condemnation from both supporters and opponents of Syria's regime. One supporter tells NPR that contacts inside Raqqa are desperate for leaflets from the coalition telling them where to shelter amid the bombing campaign. Tom Bowman contributed to this report. It's a big, confusing, messy world, and Parallels draws on NPR correspondents around the globe to connect the dots and make sense of it all. Want to know more? Check out our "About" page. Questions? You can connect with host Greg Myre and the rest of the Parallels team by email.